A Story of Blood, Sweat & Spheres!Ready your shovels for Phantasm Exhumed, the first book on the making of the Phantasm franchise. Featuring more than sixty new interviews with cast, crew, effects creators and studio executives, Exhumed takes readers behind the scenes of the franchise that catapulted the Tall Man into the annals of horror iconography. Trace Phantasm's history from forerunners Jim the World's Greatest and Kenny & Company through to Phantasm: Oblivion and beyond. Contained within are the classic tales of Phantasm lore along with production stories never before told by the filmmakers. Careful what you look for... you just might find it within this book! New details and photos from the upcoming Phantasm: Ravager! Dustin McNeill has been lurking behind the scenes of PHANTASM since 2007, the year in which he launched the popular PHANTASM ARCHIVES website. In 2008 he personally organized Michael Baldwin's return to the convention scene for several cast reunions. In 2009 he penned a widely acclaimed cover article for HORRORHOUND #17. This issue, containing his 30th Anniversary PHANTASM retrospective, quickly sold out all copies. McNeill has also designed official websites for PHANTASM veterans including co-star Bill Thornbury and talented SPFX creator Mark Shostrom. In 2012 McNeill helped coordinate supplemental features for Scream Factory's PHANTASM II collector's edition Blu-Ray release and served as an early consultant for THE BALL IS BACK documentary. 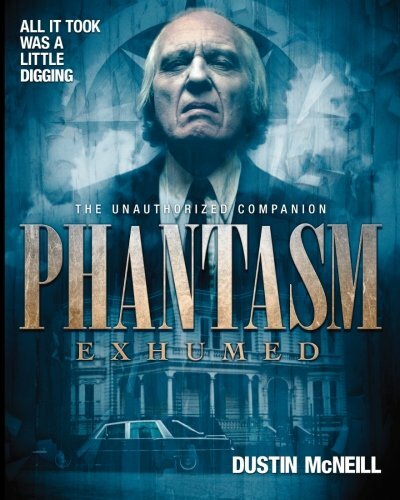 PHANTASM EXHUMED is the culmination of half a decade of research and is Dustin McNeill's first book.